Diaoyutai MGM Hospitality was established in 2007 as a joint venture of Diaoyutai State Guesthouse and MGM Resorts International. Taking advantage of the combined strength of the parent company brands, this high-end hotel management platform is focused on developing luxury hotels and resorts, residences, retail facilities and entertainment complexes, bringing a shared ethos of hospitality from China to the worldwide stage. At present, there are four hotel brands under the group - Diaoyutai, Bellagio, MGM and Mhub. Rate starting from RMB 2,208 per night. From 1st Jan 2019 to 31st Dec 2019, card holder of Visa Infinite stays 2 nights or more to enjoy complimentary daily breakfast, late check-out, room upgrade and more benefits. Located at Kuanzhai Alley, an urban style building area with over 300 years of history, and integrating the brand’s 800-year history of exquisite imperial service, the hotel offers guests contented experience with highest level of attention. The restaurants in Diaoyutai MGM hotels are world-class delicious. 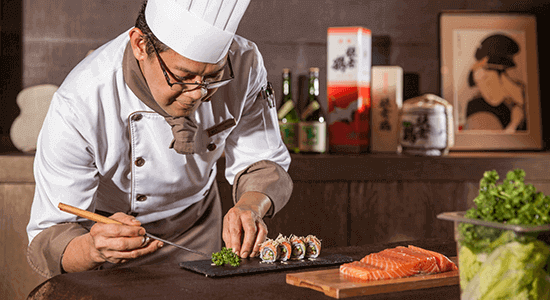 From the unique Diaoyutai Cuisine respected by the state leaders to the LAGO restaurant by world-renowned celebrity chef Julian Serrano, or international awarded restaurant, Pinju , all will upgrade your experience at our hotels. Start your trip to Diaoyutai MGM hotels and wake up your appetite! From Yalong Bay's most passionate poolside party and the energetic surfing, to the variety of interesting kids activities; from the dignified club privately settled in the ancient Kuanzhai Alley of Chengdu to the SPA center enjoying stunning panoramic view of the bund in Shanghai, Diaoyutai MGM hotels provide the most diverse choices beyond your expectation. Follow our guideline to catch the best and enjoy supper experience at our hotels.